Personalized Floral Designing! Arrangement in a Toy Truck! What is Personalized Floral Art? Folks sometimes ask, "Is there a Rittners Floral School Style of floral designing?" We believe that there are many different styles in floral designing and that a good floral designer should be able to change styles at will for different customer needs. We stress that in our classes here at Rittners. This arrangement is a good case in point. This design is considered a flower novelty. Something a little different. Something made unique because of the base chosen as the container. 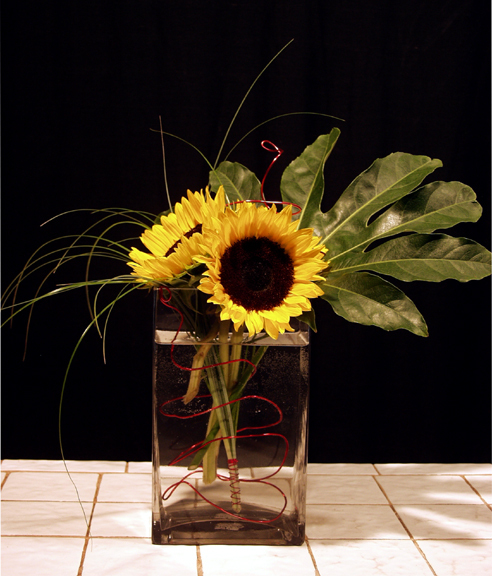 At Rittners Floral School we love novelties made out of flowers. The goal in this arrangement: Personalization in floral art. What then is personalized floral art? It is floral designing where you find out what the recipient of the floral design likes, and it is incorporated into the floral design. This is a cute floral novelty for kids or for the young at heart. It could also be used for any one in the building trades. We hoped you enjoyed this brief demonstration.